If you are an ambitious and driven person who can see him or herself in the corporate world managing over a large group of people and businesses, then our ICB business management courses are just right for you. 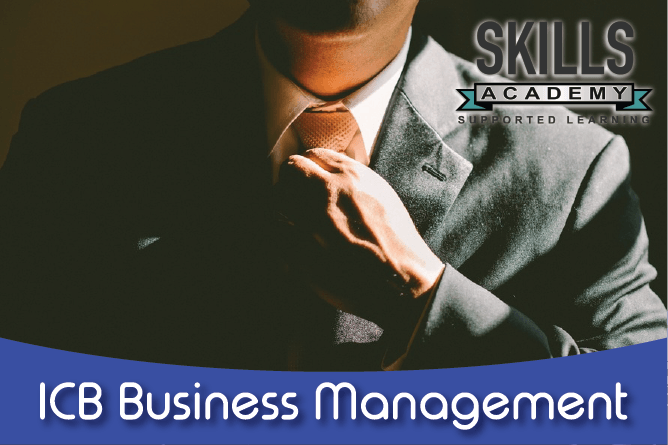 Start studying for an ICB course in business management through Skills Academy today! Business management requires that you have a broad knowledge of how businesses operate as well as how markets function and how to effectively communicate across all channels. Since businesses are part of the global economy, knowledge of the latter is also crucial for any business manager. Managing a business effectively is crucial if you want to bring in revenue and succeed in these tough economic times. If you study a course in business management you will learn all the ins and outs of effectively managing financial, staff and business affairs in a company. From managing human resources, legal issues, interacting with and researching global markets and so much more. We have you covered. The ability to use and understand data in order to analyse financial statements, markets and management strategies. Etiquette when responding to clients or colleagues in person, through email or phone. How to be an independent worker as well as how to supervise staff and various activities in the workplace. Skills Academy offers ICB business management courses. These are fully accredited, and you don’t need to have passed matric to study. In order to get started on an ICB Business Management course, you only need a grade 11. The great thing about the ICB business management courses is that you get your first qualification after passing 3 subjects! Remember, if you were studying with UNISA you would need to have passed all 42 subjects in your qualification to get your graduation certificate. At the ICB the full diploma is made up of 3 different qualifications. That means you get your first qualification, the national certificate in small business management, after only 3 subjects. You get your second qualification, the higher certificate in office administration after you complete a further 5 subjects. And you receive your final qualification, the National Diploma in Financial Accounting, after completing a further 4 subjects successfully. That is 3 qualifications in 3 years! Are the ICB Business Management courses accredited? Yes, the ICB business management courses are fully accredited by the ICB as a Quality Assurance Partner (QAP) of QCTO. Your certificate will be issued by FASSET. This means that the South African government recognises these courses as fully accredited. This also means that Skills Academy has had a site visit from the ICB to make sure that we have everything in place to offer the ICB business management courses properly. That includes that we have the right materials, staff, policies, procedures, etc to ensure that we can help you to pass the ICB business management courses. How are ICB Business Management courses structured? The ICB Business Management Programme consists of 3 levels, namely: foundation, intermediate and advanced. At Skills Academy we offer all 3 levels, taking you from the National Certificate, right through to your National Diploma. This course is ideal for you if you want to kick off your business management career. With a qualification in small financial management, you can get work as a general or small business manager or assistant manager. Remember, you only need a Grade 11 to start studying this course. A qualification in office administration is highly recommended in your journey towards becoming a fully-fledged business manager. Students with this qualification can go into various careers such as that of a secretary, office manager, human resources, labour relations officer among others. In this course, you will learn various skills and knowledge of office administration, economics, accounting, computers and more. A Financial Accountant is responsible for preparing annual financial reports, signing off financial statements. Ready for a career in business management? At Skills Academy we believe you have the necessary skills and motivation to make a success out of your life. We will assist you every step of the way to fulfil your dream of becoming a business manager. If a company wants to be successful it needs excellent business management. If you study the Skills Academy business management courses you will learn about financial and business management, legal and office practice, HR management, global business strategy, computer literacy and research methods in commerce. If you want to be employable, this is the right course for you. Why study through the ICB? The Institute of Certified Bookkeepers (ICB) is an accredited institution for qualified bookkeepers in South Africa. They have been around since 1931 and offer a range of accredited qualifications in bookkeeping, accounting and business management to name a few. A qualification from the ICB is a very prestigious achievement and could do wonders for your career. ICB graduates are able to apply for membership to various professional bodies which can help expand your network. Skills Academy offers you the opportunity to obtain this much sought after qualification. Why should you choose Skills Academy? Have you always wanted a career in business management, but never had the time to study further? You can study via home study with Skills Academy. We will assist you and keep you on the right path to ensure that you can qualify. At Skills Academy we have experts who are always on standby ready to assist you with your queries. We want you to finish as soon as possible and make the most out of your life. All of our study material are delivered by courier so that you get it in the fastest time possible. We at Skills Academy realise your time is very precious and we allow you to pay less if you study faster. Unlike many universities and colleges, our fees are affordable and can be paid in monthly instalments. This means that you can study while you work, and afford the reasonable monthly fees. We won’t do a credit check on you, so if you are worried that you have bad credit we won’t let that stop you from studying. And we won’t ever blacklist you. If you get into trouble paying your monthly fee you can put your studies on hold and you won’t have to pay until you get started again. We are here to see you succeed, and we do everything we can to make this a reality. Our ICB business management courses will ensure that you are highly employable, so you can easily find a job. You will always be able to take care of your family. Start studying with us today!